A wide variety of commonly used drawing tools are provided for on-chart notations. These will aid in displaying support and resistance areas, price movements, important stock or company events, etc. Click on the Artists Palette at the top right of the price pane. 2. This opens the drawing toolbar. 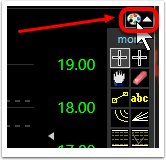 To activate any tool for chart notation simply click on the tool in the toolbar and place the cursor over the chart in the desired area. 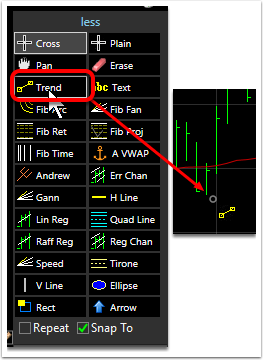 Snap: Automatically snaps the ends of the drawn line to the nearest of these points: Open, High, Low, Close or nearest Indicator. To activate Snap To or toggle it off, click the tick box place or remove a check mark next to Snap To in the drawing tools menu. (Program defaults Snapt To on). 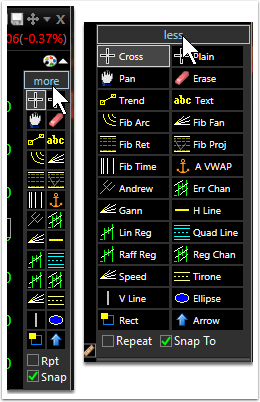 Repeat: Puts the drawing tool on repeat mode so that multiple drawings with the same tool can be added to the chart without reselecting from the drawing toolbar. To exit repeat mode, press the escape (ESC) key on the keyboard or uncheck the box next to Repeat in the drawing tool menu. To activate Repeat mode or toggle it off, click the tick box place or remove a check mark next to Snap To in the drawing tools menu. (Program defaults Snapt To off).